Cottages in Ontario Whether you are looking to experience nature, watch wildlife up close and personal, camp in beautiful surroundings, enjoy fishing with your family, or try to catch a record breaking walleye, Chapleau is the destination you are looking for. The beautiful town of Chapleau is located in the Sudbury District in the Northeastern portion of the Province of Ontario, Canada. Somewhat isolated, the nearest cities are Timmins, Sudbury, and Sault St. Marie, all of which are more than a two hour drive from Chapleau. With a relatively small population of around two thousand five hundred people, Chapleau is perhaps best known for being the home of the largest wildlife preserve in the World. Many locals and visitors refer to Chapleau as the Gateway to the Largest Crown Game Preserve in the World. At over 700,000 hectares, or 2,000,000 acres, the Chapleau Crown Game Preserve is home to bald eagles, pygmy shrews, moose, black bears, loons, and a host of other birds, fish, and animals. In fact, the moose population in the game preserve is greater than the human population of Chapleau, and the black bear population is nearly equal to the population of the town. Chapleau evolved into a community in 1885 when the Hudson's Bay Trading Company established a post due to the access provided when the Canadian Pacific Railway added a line into the area. Although hunting and trapping are no longer allowed in the Game Preserve, people descend annually to enjoy the beauty of nature that the Chapleau area has to offer. Some people come for the fishing, some come for the solitude, all who come want to return again. With a Northern Latitude, the area enjoys long summer days and a majority of days of sunshine throughout the year. The daytime extends from approximately 6:00 a.m. to 10:00 pm during the summer months and this provides for some of the best wildlife viewing anywhere in the world. A perfect place for hiking, canoeing, skiing, sledding, wildlife photo tours, or pretty much about any outdoor activity, Chapleau is also known for its great fishing. The tremendous amount of lakes and rivers allow anglers to find ample supplies of lake trout, smallmouth bass, yellow perch, northern pike, and walleye. 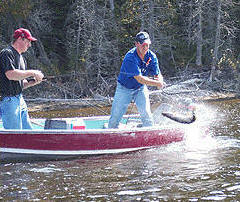 The fishing season is typically best in the spring and fall although fishermen can be seen year round in Chapleau. In fact, you may see ice fishing derbies in the winter under the beautiful Northern Lights. Fishing licenses are not difficult to come by and are very affordable. There are ample bait and tackle shops to sell you a license and advise you on the best type of tackle to use where you are headed. Be warned, if you haven't fished for walleye before you will get hooked! Known as one of the best sport fish to catch and eat in North America, Chapleau has an outstanding supply of walleye. Getting around the Chapleau area and the Crown Game Preserve is not difficult. There are many access roads that are graveled making travel by car many people's choice. Travel by boat is also a very popular way to get around whether fishing or sightseeing. For the adventurous, the float planes can take you in to experience places very few people have ever set foot upon. 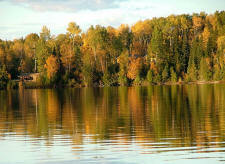 Chapleau offers some of the finest fishing, outdoor adventures, and wildlife watching in North America. You can experience the beauty on your own or team up with one of the many outdoor outfitters, guide services, or guided eco tours to see and experience all that the Chapleau Area and Chapleau Crown Game Preserve has to offer.